"His players towards the end of the season are just as fit as they were at the start, albeit covering more ground, circulating the ball at a rapid rate. This is largely down to a training program designed to have them at their optimum best in the final months... This method coupled with the slow progress of re-building after losing key personnel in the summer, plus a young squad playing three games in a week, has unsurprisingly impacted on their form between August and December." As a long season progresses, many teams find that they begin to drop away - the good form of the early months of the season a distant memory. We can think of countless examples of teams collapsing in the closing stretch of a season, missing out on European qualification or plummeting into the relegation dogfight. Aston Villa under Martin O'Neill were an excellent example. Playing with such a small core of players, fatigue and injuries took their toll - in his four years at Villa, he won just one game in March. Each year, this poor run late in the season cost the club a potential Champions League challenge. Each season, we can see the improvement in the team's performance entering the closing months of the season. In his first season, the goals conceded per game remained constant, while they scored an additional 0.90 goals per game, increasing the average points per game from 1.96 to 2.67. In each of the past two seasons, they have conceded fewer goals and scored more goals in each game in the period from March onwards. It is these repeated strong finishes that have taken Ajax to three straight titles under the stewardship of Frank de Boer. It also raises the interesting question of whether his training regime, based around bringing his players to peak condition around the start of March, is an ideal plan. At the end of the season, other teams are beginning to tire, have little to play for and find that niggling injuries are beginning to take their toll. Arguably, it means that a team in peak physical condition should have a greater advantage in each match at this stage of the season than in the respective match played at the start of the season. In other words, they should have a significantly higher points expectation for the match played in mid-March than if the same match were played in mid-October. In the modern day, a club such as Ajax are strongly built around either producing quality youth graduates or bringing in young players, all of which can then potentially be sold for a profit. 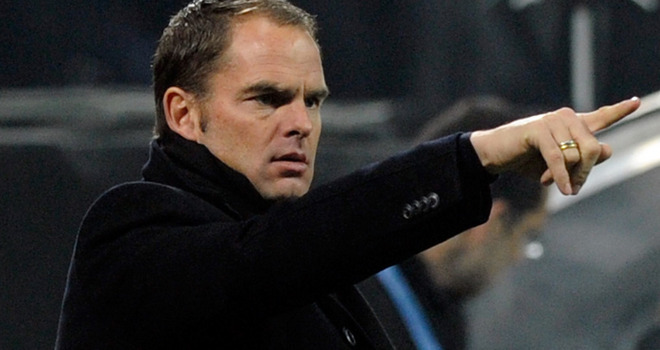 Each summer, Frank de Boer and Ajax would be expecting to lose their better players. This can be seen clearly in the list of players that have departed the club over the past three years - Luis Suarez (£23.3m), Maarten Stekelenburg (£5.5m), Danny de Zeeuw (£5.5m), Jan Vertonghen (£11m), Gregory van der Wiel (£5.25m) and Vurnon Anita (£7.5m). Indeed, over the past three season, Ajax have a net spend of -£44m. This is a pattern that is expected to repeat itself this summer. Christian Eriksson, signed for just under £900k, has been strongly linked with Borussia Dortmund, while academy product, Toby Alderweireld has been linked with Liverpool and Manchester United. This constant loss of their leading players each summer means that it takes the team a while to overcome these setbacks and for their replacements to gel into the lineup. It takes time for the new players to adapt to how Frank de Boer wants his team to play, but once they are settled and the team reaches its physical peak, they become virtually unstoppable. Were they to reach peak physical condition in the early part of the season, the gains from this would be offset somewhat by the negative aspects of the lack of cohesiveness among the squad. Instead, by peaking later in the season, they are able to utilise this physical advantage to its maximum. Their late season form stands in stark contrast to their closest rivals, PSV Eindhoven. In each of the last three seasons, PSV have scored fewer goals per game, conceded more goals per game and accrued fewer points per game in the period from March onwards than in the earlier part of the season. Ajax know that as long as they are able to remain within touching distance of PSV through the Christmas period and into the new year, they have an excellent chance to win the title. In each of the last three seasons, PSV have been ahead of Ajax on the final day of Feburary, having held a two point advantage this season, and a five point advantage in the previous two seasons. Each time, Ajax have finished the season strongly and have overtaken their rivals. The ability to finish the season strongly is an excellent attribute for a team to possess. Not only does it bring plenty of points, but it also puts added pressure onto rival teams. Knowing that your rival is likely to pick up close to maximum points means that you know that any dropped points could be crucial. Under such pressure, many teams can choke. This emphasis by Frank de Boer on targeting the last ten games of the season is a very smart tactic. It has already brought them three consecutive titles, despite the repeated loss of their leading players. He has proven himself to be a very smart and capable manager and it would be no surprise to see him being linked with some of the bigger jobs in Europe in the near future.